The title of this post pretty much sums it all up right now. We’ve been putting off assembling Josiah’s new toddler bed because it just seemed like a lot of work. A lot of work to put it together (the box said ‘easy assembly’ but it’s never easy when I’m involved), a lot of work to disassemble the old crib, and a lot of work to see if Josiah will actually sleep in the new bed. Well, thanks to some help from my Dad, we got the bed assembled yesterday and decided tonight was the night to try it out. Since I’m writing this post at almost 2:30 in the morning, you can guess how well it’s going! Josiah got really mad tonight when he saw the bed in his room. He eventually fell asleep on my wife’s lap and we put him in the bed. He slept for a good 2 and a half hours and then woke up in a really foul mood around 10:30 pm. He’s been up ever since. Why we didn’t debut the new bed on a Friday when we wouldn’t have to work for a few days and could afford to lose some sleep is beyond me now. Guess we should have thought of that. So after tossing & turning a bit, listening to some podcasts, and contemplating how my life has reached the zany state it’s at now, I decided to head downstairs with a book, my iPod, and my Mario Kart wheel. I still haven’t touched the book or iPod since I’ve been in the basement, but it seemed like as good a time as any to take the old Mario Kart for a spin again. As I sped & crashed around the turns, it dawned on me how much this addictive little game is mirroring my life lately. You see, when I play Mario Kart, I rarely feel like a winner. Sure, sometimes I’m in first place at various points, but inevitably something comes along to trip me up and I find myself in last place trying desperately to catch up. I might be leading the pack and suddenly a turtle shell is thrown at me, knocking me off course. Kind of like how one minute I’m excited thinking Josiah is making great progress with a certain area, and then the shell comes in the form of him being up all night. Sometimes while driving, you have an octopus splatter ink all over the screen while you’re driving so you can’t see anything. That’s how I feel when I can’t see if what we’re doing are the right things. Are we utilizing all the services we should be? Or I’m driving my Kart when a cloud and lightning bolt hit me, sending my Kart twirling to the back of the pack where I suddenly am struggling again. That’s how I felt last week when during a pretty good day at work, I found out my insurance is going to be a different carrier come July 1st and I now have to struggle with the state & the insurance companies to make sure my little son can get the help he so desperately needs. If I can’t get this all figured out, I honestly don’t know what we’ll do. I feel like I’ve just driven my Kart into the hot lava of the Grumble Volcano and I’m just waiting around for an angel to lift me back into the race. And there are those times when I’m feeling confident, tall, and driving with purpose. Suddenly the big ‘boom’ box shows up on the screen and reduces my driver to just a little miniature version of himself. That’s how I feel every time I think we have something figured out with Josiah’s eating or overall health and then without any warning, we find ourselves feeling shrunken. I often feel like the other drivers on the track are the other parents of ‘typical’ children we know. They seem to be able to drive around without anything bad happening to them while I’m constantly in peril. I know that I can’t see everything and they are likely getting hit with turtle shells when I’m somewhere else, but man it really feels lately like no matter how hard I try, I’m always crossing the finish line last. How I’d love to just get that first place trophy. I’d prefer it in real life, but honestly at this point I’d consider it a major victory if I could just win at Mario Kart again. Hopefully these analogies are making some sort of sense. It is almost 2:40 now after all so I might be a little loopy. But it does sound like Josiah may finally be asleep, so perhaps I have a chance tonight in this race after all. At least until someone tries to run me over again! Our church recently did a video on our family. They were doing a series called “Is It Just Me?” and over Christmas they did the final message called “Is It Just Me Who Struggles To Believe?” The message ended with this video that tells our story. Here it is below if you’d like to watch it. If you want to watch the entire message to see the context of how it fit in, you can watch it at this link. Just look for the “Is It Just Me” series and watch the Christmas service. It’s easy when you have a child with autism and he’s the only child you have to live in a bubble. We’re not around a ton of kids except for when I drop Josiah off and pick him up from his school. The kids I see at his school all have autism, so it’s not too emotional for me. Back when Josiah first started going there it was hard to see other kids with autism, but now that’s all I know and I’m used to seeing kids who generally don’t give you much attention and don’t always say a ton. So it really hits me hard when I’m in a place surrounded by ‘typical’ kids. This happens a lot during the warmer months when we’re at the park, but now that our midwestern winter is bringing us sub-zero temperatures, we don’t spend a whole lot of time outside. Sure we go to the mall or to stores, but I don’t have to be around kids too much there. But this morning I had an experience I guess I hadn’t prepared for and it was like a punch in the gut. I’m a reporter and I do a fair amount of stories on our local businesses. I was assigned to do a story on a Montessori preschool that had just moved into a new building. I should have known that this would have been a tough experience for me, but I wasn’t sure that we’d be able to film any of the kids, so I was prepared to just interview the school’s director and get a few shots of some empty rooms and be on my way. Well as my ‘luck’ would have it, all the kids there had already been approved to be on camera. I hadn’t even entered the building yet, when I got my first taste of what was to come. We were walking to go inside when I looked and saw a little guy standing by the window (he may have been a year old at the most). He locked eyes with me, smiled, and waved. I don’t know that Josiah has ever waved to me. We go in, do the interview, and then we travel from classroom to classroom to get some footage. At every stop there are ‘typical’ kids doing all the things my heart aches for Josiah to do, and these kids do them effortlessly. Without any effort on my part these little tykes would look at me, smile, point at me, talk to me, etc. There was one point where a crowd of about 10 or so kids around Josiah’s age crowded around me as they were getting ready to leave for another room. They circled me like vultures and kept looking up at me and talking to me. Now don’t get me wrong…I’m glad these kids don’t have autism and that they look healthy. But it just seems like a cruel joke that I pray so hard for my own child to be able to have a ‘normal’ life and all I get is teased by the sight of all these other kids. They were cute and all, but as they kept circling me I felt like they were little tormentors bent on playing with my emotions. It made it even harder that it happened today because when I had dropped Josiah off this morning it took a few minutes before he’d even say good-bye to me. We’ve been working on this for so long and some days he does it better than others. Today he just kept looking down and his therapist kept saying ‘Say goodbye to Dad!’ He finally whispered ‘bye’ without looking at me. That was good enough for today. I left feeling a little sad, but it wasn’t too different than any other day. Some days I don’t even get the whispered ‘bye’ so I take this as a little victory. But to go from that to what I experienced with all these kids at the preschool was just too much for my heart to take. I just wanted to sit in a corner and bawl or scream or something. But I figured that wouldn’t be an appropriate action for a grown man in a preschool, so like I’ve learned to do, I just buried the hurt deep inside and faked a smile or two. Will it ever get any easier? I’m so proud of my son and I know that none of this is his fault. But it still doesn’t make it any easier to have to work so hard for the most basic things while I feel like everyone else gets what they dreamed of. I guess I just have to cling to the hope that someday our time is coming and we’ll get to experience these things. I’m just scared some days that I’m fooling myself and our time will never come. It’s hard when you know you’re doing all the things you’re supposed to do to get results (aba therapy, biomedical stuff, etc.) and some days you don’t feel like you’re any better off than you were months ago and the rest of the world keeps running circles around you. So another year is rapidly drawing to a close. I have to be honest and say that 2008 wasn’t the best year of my life. 2007 didn’t end all that hot either as that’s when we first learned that Josiah had autism. I think 2008 started out ok because we were still so busy getting everything in place for Josiah and we had a hope that all the stuff we were doing would make a huge impact. It’s not that good things didn’t happen in 2008. I think the reality just set in pretty hard that it’s going to be a long, uphill battle. I feel like everytime we’re making some progress up this ‘autistic mountain’ we get knocked down a bit. We inevitably get up and dust ourselves off and start trekking upward again, but we have some bruises and scars to show for the fall. I was very hopeful at times in ’08 when we thought we had really cleaned up Josiah’s gut and we were beginning chelation. But we eventually had to stop the chelation and now we’re dealing with yeast issues again. We’re hopeful that some changes to Josiah’s diets will bring great improvements this year. I’d like to say that I’m totally hopeful and excited to start some new changes, but frankly I’m just tired and I don’t have the wide-eyed hope I once did. So I guess here’s some things I’d love to see happen in 2009…. –Josiah responds well to any dietary changes we make. He has such a limited diet now that I can’t imagine having to refine things even more, but we’re hoping that once the gut starts to heal, that he’ll crave the good foods his body needs. It would be good if this worked on me too…I could definitely stand to crave good foods. This holiday season has really added a pound or two to my six pack abs. –I hope those above-mentioned dietary changes produce great results for Josiah. Who knows where he’d be if he hadn’t been on the GF/CF diet the past year, but he may even go farther with a more specialized diet. –I’d love to see an explosion of language come from Josiah’s mouth. It’s so hard knowing that the words are there, but that he just can’t/won’t say them. I know it wouldn’t solve everything, but to be able to converse with him would make things a little easier. I so badly want to hear that little voice and know what he’s thinking. I can tell that a little jokester is lurking inside him and I want to be able to have the conversations with him that all of my friends with ‘typical’ 3-year-olds get to have. –I’d love to see our new President be a champion for families affected by autism. It would be great to see all 50 states require all insurance carriers to cover therapies such as ABA. It would also be great to get insurance coverage for supplements even if they’re natural. Why we can get coverage for any old drug but not a natural solution is pretty crazy. Also, let’s get some funding dollars thrown in the right direction. Quit wasting time looking for the elusive ‘autism gene’ and fund things like what the Autism Research Institute is doing. Let’s clean up the vaccines and give creedence to those who dare suggest that vaccines, environmental factors, and foods could be playing a part in all of this. –I’d also love in 2009 to see fathers of autistic children connect with each other. I’m sure this is happening somewhere in America, but frankly I’m not finding it. There seems to be many websites that help mothers connect, but not the fathers. I know that too many fathers flee the scene or are just too busy working to pay for therapies, treatments, etc., but it would be great to encourage each other. –I guess overall I would just love to see 2009 be a year of restoration and recovery for this family. I want Josiah healed, and I want to feel alive again. I feel like autism is besting me in this battle and something has to give. I truly believe that 2009 will be a very important year for my little family. If we can make it through this one, we might just make it through anything. I mentioned in one of my last posts about some recent struggles trying to get Josiah to wear his glasses. About a year ago we noticed that Josiah was squinting and thought maybe he had vision problems. We even thought for a brief second maybe that’s what was causing the delays we were seeing. I remember for at least one evening thinking, “I bet he just needs glasses! He’s not autistic!” But alas, he did need glasses, and is also autistic. It took us a good four to six weeks to get Josiah to wear his glasses. The minute we’d put them on, he’d take them right off. What ended up working the best for us was to sit across from him, put on his glasses, and then grab his hands and start ‘rowing’ together. We think it was at this time that Josiah really fell in love with music. We would sing “Row Row Your Boat,” “Day-O” and other assorted songs. After many, many days wondering if he’d ever wear the glasses on his own, Josiah finally caved in and started wearing them full-time. For almost a year he would wear them without incident. Then a couple of weeks ago he just woke up one morning and refused to let us put them on. We thought it was a bit strange, but figured if we gave him a few minutes he’d give in. Well, almost two weeks went by without him agreeing the wear them. We were left to wonder….is he just showing some stubborn traits of a typical little guy his age, which could actually be a positive sign? Or are the glasses too tight? Wrong prescription? Since he doesn’t answer those types of questions right now, we were left to guess on our own. In theory this shouldn’t have been that big of a deal. We know he’s capable of wearing them and with time we knew he’d likely give in and start wearing them again. But I think his glasses are full of symbolism for my wife and I. Anytime things got tough, we would say, “Remember how hard we battled with those glasses? Hey, we won that battle and we can get through this too!” So when he stopped wearing the glasses, I think we became disillusioned with the world and weren’t sure if anything would ever go right for us again. In a way, Josiah’s timing wasn’t all that bad. We actually just bought a new pair of glasses and knew the transition from his old pair might be a challenge anyway. So now we could just focus on him wearing the new specs. We met with some of his therapists and they suggested that starting on Monday we would make it clear to Josiah that not wearing the glasses was not an option. They would spend the whole day putting them on if they had to. He wore them the whole car ride home too. I couldn’t wait for my wife to get home so she could see how cute he looked. But just a couple of minutes after getting home, Josiah took off the glasses and was under no circumstances going to let me put them back on. He doesn’t seem to give my wife as hard a time though. I think he knows that she won’t cave, but that I’m liable to get frustrated and take a break when it gets too tough! I don’t know that the battle is totally won yet. This morning we struggled for a while, but he was wearing them when I dropped him off at school. I’m sure we’ll have a few more struggles, but we’re already making more progress than I would have thought at this point. Josiah’s not the only one with clearer vision through this though. As we’ve been wrestling around, trying to get the glasses on, it occured to me how much worse things could be. 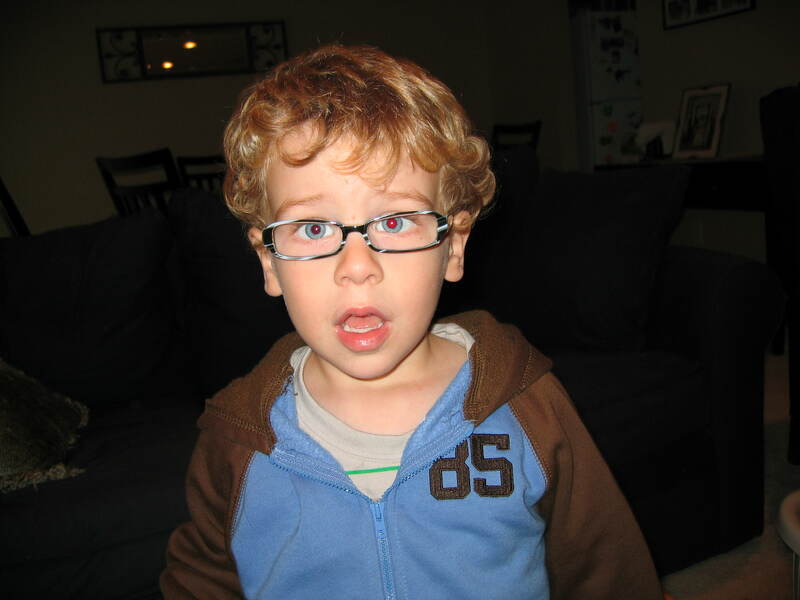 I can easily think that getting a 3 year old to wear glasses is the most challenging thing in the world, but there are so many parents out there facing much bigger hurdles than we are. I’m so proud of my little guy and as you can see, he’s quite a cool lookin’ dude in his new frames! I’ve always been a fairly sentimental guy, so I like birthdays and anniversaries and days that give you a moment to reflect on what happened in the past and what your present is like. Over the past week I’ve had the opportunity to mark two pretty big anniversaries in my life. One that is quite exciting and in this day and age all too rare. The other caused some pain. First, the good one. My wife & I celebrated our 10th wedding anniversary. We had a great little getaway thanks to the grandparents watching our little guy for a few days. It was fun to take a trip down memory lane and recount some of the adventures we’ve shared over these past 10 years. We have no idea where the time has gone. It’s kind of neat to think back to a time when we were so young and didn’t really have too many troubles. I had a nice head of hair and a bright future. I’d like to think I still have a bright future ahead of me, but the hair…well, not so much! During these 10 years we’ve certainly faced some challenges along the way, but we’ve really had a wonderful time. We used to be surprised at how many couples we knew who struggled in their relationships. We figured that marriage wasn’t rocket science and that we were kind of experts at it. Other than having a few minor arguments about directions while driving on road trips, life was pretty easy. That’s where the second and not-so-good anniversary comes in. It was a year ago that we first became aware that something might be wrong with our son. We never saw it coming. Just one day before we we first alerted to it, we were taking a day to celebrate our 9th wedding anniversary. Even though our lives were more stressful than our first year together with a child and full-time jobs, we were still feeling like kids. Talking about future plans, future trips we wanted to take, hopes and dreams for our son and our little family unit. But once our eyes were opened to the possibility that something might not be right with our son, our world was thrown into a tizzy. Fast forward to now and we can certainly see that we’ve accomplished a lot and our son is really doing pretty good. But just thinking about that time last year when all of this started gives me that sick feeling in my stomach all over again. We’ve had moments this past year where we feel stronger than we ever could have imagined. But there’s also been times where I didn’t know if I could sink any lower. Suddenly I realized that you have to work a lot harder at a marriage when there’s a never-ending amount of stress to deal with daily. Fortunately our marriage is strong enough that even with the challenges of this past year, we’re still here. Too many marriages crumble under the stresses that come with having a child with autism or other special needs. I pray that no one else ever has to go through what we’ve been and still are going through. But with the rising autism rates, there are sure to be many other couples facing these challenges on a daily basis. My hope is that someday this autism anniversary won’t even be remembered. In my dreams we’re too busy having fun as a family and letting others know how we recovered our son.